An amazing deal from Ryujin - this is a monotempered 1045 carbon steel blade mounted in high quality lacquered natural wood fittings at a price almost anyone can afford. 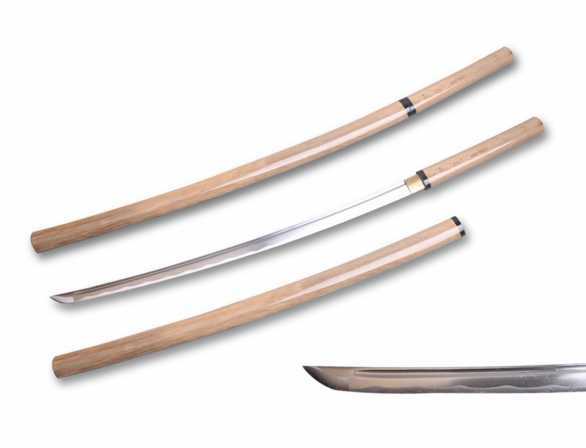 The blade is the most common type, Shinogi Zukuri, and features a full length bo-hi (fuller) with the weight of the sword itself an incredibly fast and light 1.6lbs. While we generally do not recommend Shirasaya swords for cutting out of the box by inexperienced sword enthusiasts (as without a hand guard,there is a slight danger of the hand slipping onto the blade) this sword is perfect as a display piece, as the foundation for a DIY remounting project (it can be stripped down and has one mekugi peg like a traditional katana), or just a relatively inexpensive, but real carbon steel blade that you can use to experiment on - testing sword sharpening techniques and polishing before attempting it on a more expensive blade. 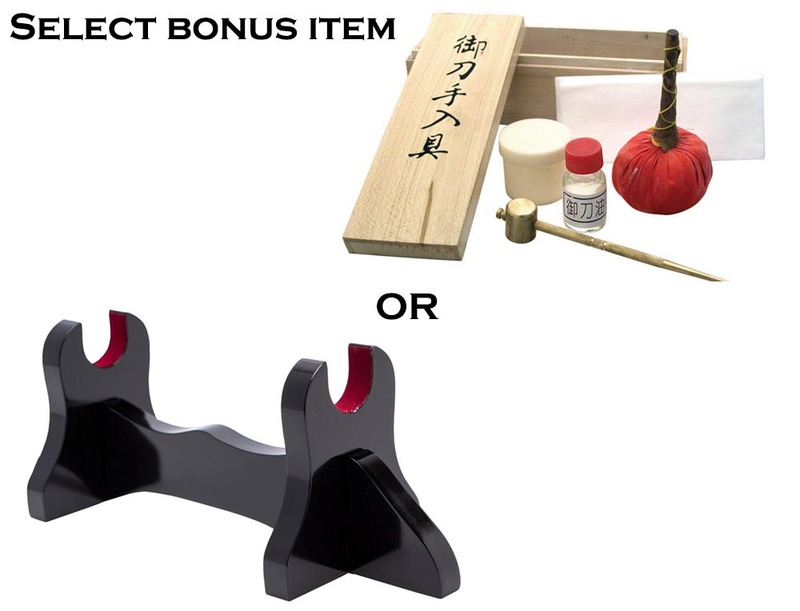 However you decide to use it, and no matter which way you look at it, it is quite a bargain - and even comes with a free bonus item, select from a glossy black single sword stand for display or a budget cleaning kit to practice cleaning, polishing, etc. Suitable for display, a base for DIY projects (can be disassembled) or as a first carbon steel blade to practice sharpening, polishing, etc. Overall (with scabbard) : 40 1/4" Overall (without scabbard) : 38 1/2" Blade length: 26 3/4" Handle length: 10 3/4" Weight(with Scabbard) : 2.1 lbs Weight(without Scabbard): 1.6lbs Point of balance (from point to bottom of handle ) : 18"
1045 Hand Forged and Factory Sharpened Blade. High quality lacquered glossy natural wood shirasaya fittings. One meuki peg, can be disassembled.